Star Vijay TV - Best Tamil Channel: Are we ready for Super Singer Junior 3 ? 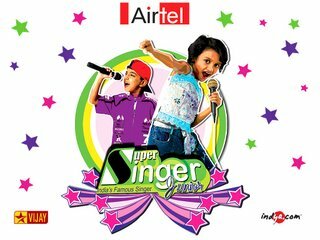 With Airtel Super Singer 3 almost nearing the finals, the promotional videos for the next season of Airtel Super Singer Junior 3 has been started by Vijay TV. Undoubtedly Vijay TV's Airtel Super Singer has been the most popular reality show in tamil television channels. But, the question here is are we really ready for the Super Singer Junior 3. Overwhelmingly most of us would tell Yes for this question and its fun to watch Junior Super Singer show. Usually Super Singer in Star Vijay TV has been extended over and over again. These days each season go for a whole year and ofcourse its interesting in most part of it. We knew that there was a rumour that Chinmayi didnt continue hosting the Airtel Super Singer show since it has been extended over the actual contract. But, I think the show has matured enough to run several seasons from now. I dont see any reason for the show to come to an end. In the last two years the Airtel Super Singer grand finale has been airted live in Vijay TV which is a real good news and they have done that well. Super Singer's popularity has made Vijay TV to give away super duper prizes which range from LCD TV to Gold bracelet to Car and to house. Now, the prize for the Super Singer 3 is villa which is valued at 40 lac INR. I think in next few seasons they will start giving prize in the range of crores. Last season with the seniors had the opportunity to sing in Yuvan Shankar Raja's composition and Ajeesh got that chance along with Car as gift. Then, the last season of Super Singer Junior had the prize of house in Pondichery worth 15 lacs and it was given to both Alka Ajith and Srikanth. In the current season, there were similar prizes in the preliminary rounds with top 40 contestants which ranged in all categories. All these said, are we ready for the Super Singer Junior 3. Ofcourse YES for most part of it in the entertainment but I am not sure how much the kids will get affected since the shows are usually made late in the night and goes for a whole year. I am happy to see the last season juniors Nithyashree, Alka Ajith, Shree Nisha and Priyanka already sang in movies but still our environment gives first importance to education. Also, we remember that these kids after their last season of Airtel Super Singer, they also got into Junior Superstars, another singing competition between the south Indian junior singers.